If you’re a baseball fan first, it’s a night you’ll never forget. 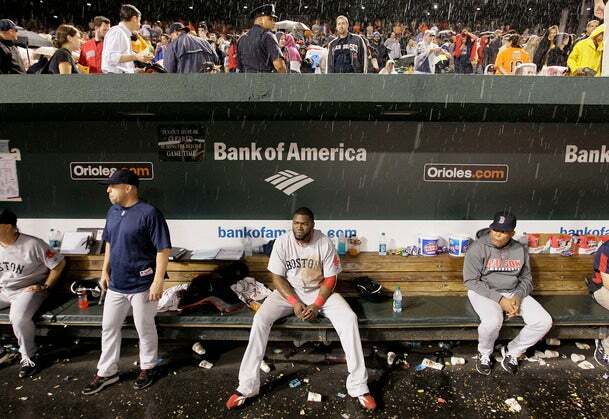 If you’re a Red Sox fan first, it’s a night you’ll never be allowed to forget. The 2011 Boston Red Sox completed the worst regular-season collapse in baseball history last night, gagging away … well, hell, you know. We’ll keep today’s postmortem brief since we’ll be considering and reconsidering this 7-win, 20-loss September nightmare through the winter and spring and probably beyond. Seven wins. Twenty losses. And none more painful than the last. Oh, yeah, this one is going to linger, folks, right up until the Red Sox win something meaningful again. In ’78, the Red Sox showed tremendous resilience after their famous collapse, winning their final eight games of the regular season to force a one-game playoff. In 2003, it was an extraordinarily admirable team done in by a fierce, talented rival and its own molasses-brained manager. This . . . this is just. Appropriate. This is right, how it should be. It stinks if you’re a Red Sox fan, but it’s the frigid truth. The Red Sox gave the Rays every chance in the world to steal their place in the postseason. Took ’em to the 12th inning of their 162d game, but damned if they didn’t do it. You could say Joe Maddon‘s crew ripped the Sox’ heart out. But first we’d require proof that they had one in the first place. Save for but a few — the great Jacoby Ellsbury, Dustin Pedroia, Alfredo Aceves, perhaps Marco Scutaro — I don’t sympathize with this crew the way I did with Yaz in ’78 or Buckner in ’86 or Pedro and Wakefield and just about all of them in ’03. These guys did this to themselves. How did it happen? Why? It feels like there are pieces of the knowledge puzzle missing. Is it chemistry? It’s not a lack of ability — the Sox were the best team in the American League through much of the summer, going 81-42 from the conclusion of the 2-10 start until September 1. On that date, they were on cruise control toward October, nine games up on the Rays in the wild card race. Two days later, Baseball Prospectus gave them a 99.6 chance of making the postseason. So now we know what 0.4 percent looks like. Last night was a microcosm of the whole month of September, right down to the shell-shocked Carl Crawford botching a catchable ball again, Robert Bleepin’ Andino tormenting blank-eyed Jonathan Papelbon again, and the Rays digging out of the grave again, coming back from a 7-0 deficit against the Yankees, who did an honest job of maintaining the game’s integrity while also preparing for their long-since secured postseason berth. The eerie juxtapositions of events of last night — the Rays winning on Evan Longoria‘s walk-off homer mere seconds after Andino and the Orioles had staggered the Red Sox, when a Boston victory and a Tampa Bay loss had both been one out away from reality earlier in the game — became instant baseball lore. With a similar dramatic collapse by the Atlanta Braves concluding in the National League, it was a compelling, unforgettable night of baseball, provided your spirits didn’t get crushed like a John Lackey fastball. Last night was the denouement of a month’s worth of horrendous performances from those who make up this $161 million roster, of all of the innings wasted by a lack of urgency, inspiration, and a shortage of timely pitching and hitting. Don’t let anyone tell you that injuries weren’t a reason for this — Kevin Youkilis and Clay Buchholz and even Daisuke Matsuzaka would have made a difference, and Adrian Gonzalez‘s power was sapped by shoulder and leg woes — but don’t let anyone tell you they were the reason, either. Talented, richly compensated players did not perform, starting with Lackey, who simply cannot return to this team or this city next year. Not only is he coming off the worst season a Red Sox starting pitcher has ever submitted, but he’s a miserable, dim, finger-pointing, unaccountable wretch of a teammate, and those may be his good qualities. That the Red Sox were apparently considering acquiring lefthanded mediocrity Bruce Chen to pitch a one-game playoff if necessary tells you all you need to know about Lackey’s status with the team. Pack up the sneer and the sacks of unearned cash and just go away. There are others who will be called to the witness stand today. Gonzalez has some lovely statistics and the dubious distinction of being a featured star on a second straight team that collapsed down the stretch. Big Papi’s clutch mojo has been absent so long that a huge hit in a pivotal situation seems more like a tired wish than a real possibility. Josh Beckett and Jon Lester need to pitch up to their reputations, and I think they should seriously shop Beckett. I can’t believe I’m sitting here watching ancient Johnny Damon get interviewed after earning yet another trip to the postseason while I wonder why Carl Crawford, the player Damon helped replace in Tampa at a fraction of the cost, plays with such timidity. What has happened to that dynamic player who tormented the all those years while he was in Tampa Bay? And is he gone for good? Because right now, he’s Coco Crisp with a lousy glove. The man who put this bunch together won’t escape cross-examination. Theo Epstein is a tremendous general manager when common sense and context are considered, but he must be accountable for the Lackey and Crawford contracts (provided the latter wasn’t pushed on him by ownership desperate to boost NESN ratings). I do not want him to lose his job or bolt for the Cubs by any means; I want him to find his way out of this mess he has created. And I trust he will. As for the manager, please don’t bring those ill-considered gripes to me, the reactionary argument that someone’s head has to roll, that Terry Francona has gone too soft. Save the shrieking for someone else; I’m going to be more infuriated if Francona leaves than I was when Papelbon threw that meatball to Nolan Reimold. Just because Francona doesn’t light up his players to the media doesn’t mean he’s passive behind closed doors. He’s honest, funny, and sarcastic — I’m sure he gets his points across. Again, please, try to keep perspective, and that goes double for anyone in ownership who wrongheadedly thinks Bobby Valentine is the solution to anything. Have we actually forgotten during this meltdown and his helplessness to prevent it that Francona has so many essential attributes and admirable accomplishments, starting with those two championships? It wasn’t so long ago — I suppose August is the correct answer — that a third seemed a real possibility this year. He handles the complexity and ancillary nonsense of the managerial job in Boston as well as anyone ever has. He is usually rewarded by his trust in his players; don’t make him the scapegoat because they failed him this year. You want it to go back to the way it was before 2004, Mr. Henry? Start by dumping the best manager the Red Sox have ever had, and you just may get that wish. If Francona leaves, it had better come on his own terms. Just because the Red Sox blew it in agonizing fashion doesn’t mean the whole organization needs to be blown up. Keep Theo, keep Tito, and erase all evidence that this Lackey thing ever happened, and the optimism for 2012 will return soon enough. Who knows, maybe you’ll even sell a few bricks. Just don’t let a bad ending destroy what should still be a good situation once the shock and disappointment fade.